Looks like the tiny is not so tiny with these new devices. Even seems to have some xmega type features. Hmmm, no external high-speed crystal option. Only 16/20MHz internal RC oscillator or external clock. ...and not a sniff of them being available. First a tiny was a AVR without USART. then it was one without HW mul. So we have a new?? programming and debug interface UPDI. Smells like DW. A DAC finally even if only 8 bits. I vote that the Atchip/Micromel sales department issues a development board to each one of us who posted on this thread just like what Atmel used to do when it used to have a "soul". Are there any target price? Price? Let's start with availability first! By the time they hit the disti's shelves there'll have been a couple of price rises in the meantime. 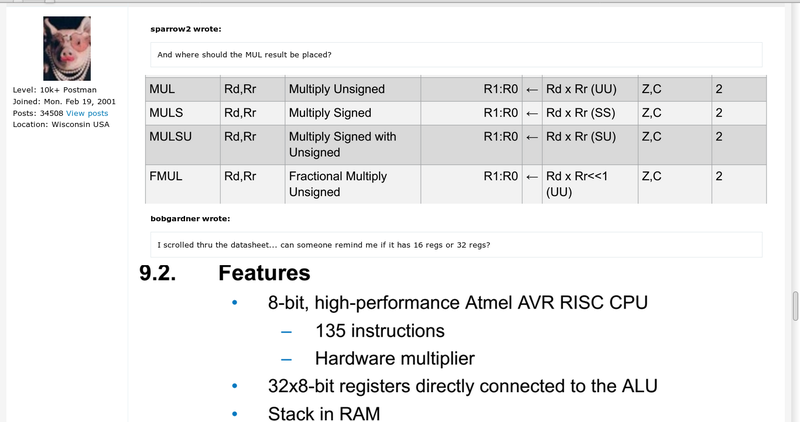 Atmel don't have a good track record when it comes to availability once a datasheet appears. No price indications, and code size is a little small. Will this fix problems of compete with present "Capable 8 bit" price-leaders of SiLabs, ST, Nuvoton etc ? Seem to be much better. I was idly looking at 32-bit chips the other weeks on Farnell/Element 14 and spotted that they had 100 of each of a PIC32 variant called the MM range which was new to me and when I looked it had only been announced a few weeks earlier. It is a Tiny.... looks very capable little beast. The second parties are being primed. I have the same opinion. HW multiplier = Mega. Why call it Tiny? And where should the MUL result be placed? What is this "Unified Program and Debug Interface"? Is it a new debug interface? At least it seems to be documented. Edit: Event system, advanced timers, programmable logic, DAC, ADC with accumulation feature, HW multiplier... this will not come cheap, that's for sure. I scrolled thru the datasheet... can someone remind me if it has 16 regs or 32 regs? I could use an t814 now! By now, Oscar must have quite a stack of things shipped to me in Illinois. Lee, you know you can click in the corner of your inserted images and reduce their size, right? AFAIK at least on my Firefox, they size to the width of the pane as you are observing it. So no real need to reduce when cutting/pasting PDF fragments as they "auto size", right? on my Firefox, they size to the width of the pane as you are observing it. After a quick think, I'll opine that when posting a fragment of whatever -- datasheet, schematic, ... -- sizing to fit the width allows max magnification according to how the >>viewer<< has set the browser pane size. Now, if I pull a bigger chunk of datasheet indeed I'll often change the PDF viewer zoom setting before taking the Snapshot. In one sense, it >>is<< consistency in font sizes as that is how I view my PDFs Fit to Width. So blame Firefox and Foxit. Also, did you ever think that I might have been trying to make a point about "scrolling through the datasheet"? Besides the piece I quoted, letting the PDF viewer search for "32 general" gives hits; "16 general"/"16 reg" does not. In the time it took to compose the forum query when "scrolling through the datasheet" several searches could have been done. Similar to the 3 levels for an XMEGA PMIC. In one sense, it >>is<< consistency in font sizes as that is how I view my PDFs Fit to Width. But font size consistency is another matter altogether. Look at the above screenshot: when you cite two pieces of the same datasheet they come up with vastly different font sizes, respectively ~3 and ~5 times bigger than the forum font (on my setting). Your PDF fit-to-width is based on a constant page width, thus it yields consistent font size; Your excerpts are not. If you really liked the former, you'd do as I suggested. Indeed for breadboard though the SMT-to-DIP adaptors are common. Did you download the summary or the full version? No-DIP is simply a sign of the times. You can't make pointers to registers! so loading registers can't be done with general routines. And the comments about the LPM instruction don't make sense to me! it take 2 clk but have the comment (1) that say add one cycle if it use NVM!!!!! does this mean that LPM is the same as LD nn,Z with last bit flipped (or perhaps as a don't care) , if not it should just say 3 clk. And even though the memory seems unified, it's not possible to execute code from ram or eeprom (I think, from skimming through the datasheet). What do virtual ports a,b,c do? I had a quick look at the release notes for AS7-10006 but no mention yet of these chips. I guess we will need to wait for the latest (and bug free of course) version of AS7 before we can even have a look at anything. We should be graced with an update "momentarily" as the last release was in June? hmmm will it still be AS7 or some other weird version of MPLAB with the Atmel toolchain bolted on?? I think they just need to update the ATtiny_dfp device pack. I just checked in the device pack manager for updates but none yet. It's sad but I guess I know why. It happend first time for Xmega's , and a good guess is that it gave problems with the DMA controller if the reg. also was on the addr buss. But this chip don't have a DMA controller so here I don't see a problem , (and even if they had to add one clk it would have been nice, now you can't load a reg without it's absolute name sad sad). No data on the XMINI - anyone know how XMINI/XPRO differ in Debug support chip and features ? My idea from #7 https://www.avrfreaks.net/comment... (last paragraph) is still a pretty good one for me. After all WE are providing free support. I vote that the Atchip/Micromel sales department issues a development board to each one of us who posted on this thread just like what Atmel used to do when it used to have a "soul"
That's an excellent idea. I happen to have a box of 35 Tiny817 Xplained Minis heading my direction, and will distribute to those already active in this thread (~20 people). For the rest of the kits, any constructive comments about the tiny817 will be awarded. Everyone already in the thread, please PM me your shipping address and I will send out the kits ASAP. For new posts I will PM you and ask for your address. Perhaps we should make a plan over different TUT's, to get this up running. OK PM sent however I'm not sure if AS7 supports the chip/board yet? I see that build 1118 supports it?? I have a few versions behind on my laptop (build 934) , I'll wait until the packs issue has been fixed before updating. Ross it's all about global WARMING not cooling like they used to tell us 40 years or so ago. So how do you plan to use your brand new ATTINY817-mini? I guess you can wait until BASCOM adds support for it. Anyway AS7 is safely confined to my laptop inside a Faraday cage and 8" concrete bunker, surely it can't be causing much trouble. @John. I might just have to bring my caravan up your way and inspect your bunker. Remember that 40 years ago I was working at the Bureau and designing/making drifting buoys to measure sea temps that helped develop all of those predictions. So blame me if you must! @Morten. I love that graph and have screen captured that image for future use. Excellent! 1 does the rjmp/rcall reach all 8k as normal 8 k devices? 2 I'm still not sure if the 32 registers are memory mapped. But like always a lot of guessing when you read the datasheet's, nothing seems to have improved there. Looking at the peripheral module address map (section 7.1 in the datasheet), VPORTA/B/C and other stuff are placed from address 0 onwards. And to my delight, I see that they have also added some general purpose I/O registers. A feature I use quite often in the XMega line. Directly addressable single-bit values for status flags or similar. The register file is located in a separate address space, so the registers are not accessible as data memory. Does anyone know about the new program/debug interface for these, UPDI (that I take is similar, but not quite equal to PDI)? The Xplained Mini boards have their own debugger, but I am thinking a little further ahead to where I may start to use these new Tinys in my own circuits. Will existing programmers/debuggers be updated to support the UPDI? I currently have a JTAGICE3, but as that is now superseded by Atmel-ICE I fear that I am out of luck. Since UPDI seems to be fully documented, I was thinking someone could program, let's say, an arduino nano to translate stk500 to UPDI and act as programmer. Then we could use avrdude to program these new chips.